Alright. Week 4 of Bob's Skinny Rules done. I'm still shocked at the results. I lost another 1.5 pounds this week (which is crazy for week 4) and am at a total of 11.7 pounds lost. In a month. This is unheard of for me. I'm running outside, even with the heat (thanks friends for keeping me company!). My pace is getting faster. I'm feeling really good about this second cycle of marathon training. But honestly, friends? I'm kinda struggling a little right now. I'm really wanting chocolate. I had Justin's Chocolate Hazelnut Butter on my toast the last 2 mornings, just to meet that need in the healthiest way I could think of. And the last few evenings, I've been struggling with hunger a little. But I recognize that this is just for a few months. And it is getting me where I want to be. I'm finding the whole process kinda strange, though. I'm not reacting the way I always thought I would. The plan (I hate to say "diet") is restrictive. There are things that I cannot eat. There are recipes and snacks that become repetitive. I always thought that these things would be deal breakers for me. I love to cook. Creativity in the kitchen is a huge outlet for me. But instead of feeling bored, I'm feeling comforted. I know that I'm working the program correctly. I don't have to wonder if certain foods are Bob Approved. I don't have to worry that if I make a change, I may not lose. I know that our menu is good. It takes the guess work out of it for me. Again, I'm glad that this is short term, but it is actually a relief right now. Not sugar. Not fried food. Not a huge amount of food. 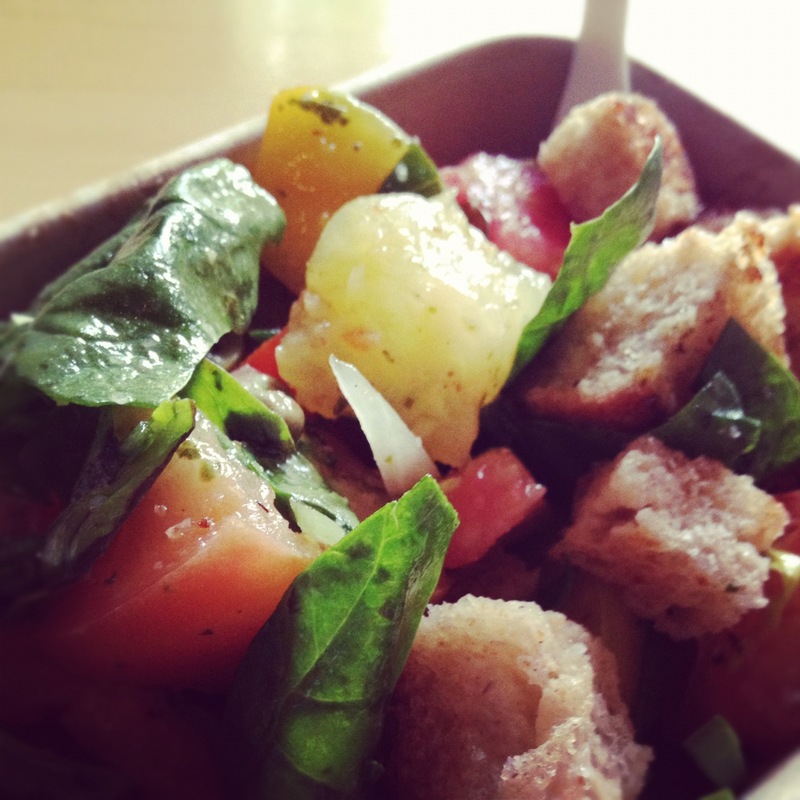 But this lovely tomato salad (from the Fork in the Road food truck). It was "cheat" because it was dinner and there were carbs. I'm all about the carbs for breakfast and lunch, but they're off limits for dinner. I just couldn't turn this down on Tuesday night though. And I made it work. I think it would it would be a challenge to work this program on a vegetarian diet, but I'm sure it could be done. We are eating more meat now than we were prior to starting this program, but that's mostly because I wanted to follow the program to-the-letter the first few weeks. As long as you are comfortable finding other ways to get your protein in, you'll be fine. I think it would be next to impossible to follow a vegan diet, though, because I eat a LOT of dairy. This program is one I will follow until I meet my goal weight. Bob talks about reintroducing things back into your diet. He says that beer isn't gone forever. And that pasta for dinner isn't gone forever. But they need to be off-limits until you get to your goal weight and are comfortable maintaining. And then they will become the exception, not the norm. I am treating this program as a phase. I am working this program until I get to a weight where I am content. I am secure in my ability to maintain weight loss, but the challenge will be for me to figure out which rules are necessary to keep the weight off. I have a while before I get there though! I've also talked to several of my friends (Lydia and Cassie, to be exact) about my take on the daily 1200 calorie limit. I agree that, for a lot of people, that is really low. It is frustrating to me that Bob doesn't address working out in his book at all. I took the stance that my goal is 1200 net calories a day (the total of what I eat minus what I burn off). If I'm lower than 1200 net calories, I don't try to eat the difference. But as long as I'm under, I'm happy. It doesn't matter if I net 1199 or 900. If I'm under 1200, I'm happy. And on rest days, I'm happy with 1400. That happens maybe twice a week, and my weekly average is still under 1200. That seems to be working for me. But that's just me. Are any of you following Bob's Skinny Rules? How is it going for you? Any other questions?